Ken Ham is the founder and leader of Answers in Genesis, a Christian ministry that teaches the earth is around 6,000 years old. Ham’s also responsible for the Creation Museum. I do believe there can’t be other intelligent beings in outer space because of the meaning of the gospel. . . . God’s Son stepped into history to be Jesus Christ, the “Godman,” to be our relative, and to be the perfect sacrifice for sin—the Savior of mankind. Jesus did not become the “GodKlingon” or the “GodMartian”! Only descendants of Adam can be saved. For Ham, if aliens don’t appear in the Bible, then they don’t exist. 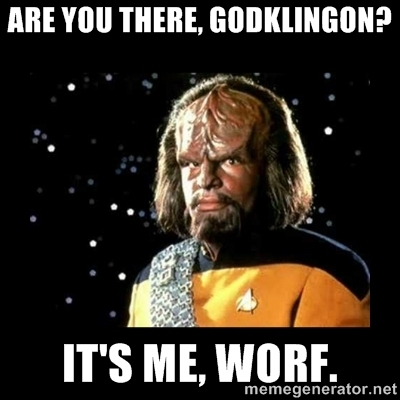 Tough break for Worf. I don’t think he minds, though, since he’s the Worf of Starfleet. If you haven’t seen his parody of The Wolf of Wall Street, stop whatever you’re doing and watch it. Back to Ken Ham. Friday night, Bill Maher and Neil deGrasse Tyson picked up the story. Their commentary is only 30 seconds; Tyson’s one-liner is worth watching. They both miss what Ham’s saying. Ham thinks searching for aliens is useless because he doubts their existence, not because he thinks they’re going to hell. Sure, most of what Ham says about science, the origins of the universe, the origins of life, and theology doesn’t stand up to even the lightest scrutiny, but even more problematic is his lack of curiosity. For Ham, the question of whether or not there’s life elsewhere in the universe isn’t even worth asking—precisely because we already have the answer. It’s this lack of curiosity that makes biblical literalism so damaging, scientifically, socially, and politically speaking, for once we have all the answers there’s really no need to explore, discover, or create. We have no theological problem with the idea of intelligent life on other planets. . . . John has written elsewhere that if there are “Little Green Men” then God might well have taken Green flesh. That’s great news for Marvin the Martian. Black Jesus, a comedy from the creator of The Boondocks, debuts August 7th on Adult Swim. The show has already caused much controversy, including numerous calls for its cancellation. What do you think of the trailer? Does the show look blasphemous, offensive, or funny? As I pointed out in my mailbag post earlier this month, there are many rapture movies and shows these days. I just heard about The Remaining, a Christian horror movie—at one point it was rated R. It’s now down to PG-13, and will hit theaters September 5th. This movie differs from the Left Behind take on the rapture. For more info on the movie, check out their website. Scarlett Johansson’s new movie, Lucy, came out Friday. The film says that we only use 10% of our brains. Johansson’s character ingests a drug that lets her use more than this amount, turning her into Neo. Unless you have a traumatic brain injury or other neurological disorder, you already have access to 100 percent of your brain! . . . Even the most basic functions of your brain use more than 10 percent . . . We’ll have to wait for some other type of fictional drug to turn us into crime-fighting mutants. Personally, I liked this movie better the first time I saw it, when it was called Limitless. Like this post? Select an icon below to share it. Also, phenomenal reference to Worf & Judy Blume! wizard that is launching his grasp program on the website visitors tips of youtube.